Some people are reluctant to express their reservations against travellers’ sites for fear of being labelled prejudiced or worse. 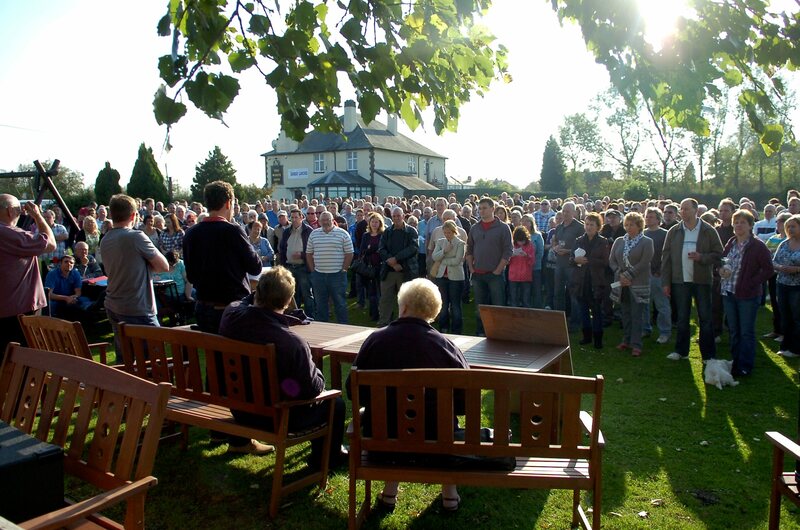 But the fact that almost 400 people turned out at the weekend to protest against plans to create a gypsy camp near their homes shows the strength of feeling against such developments. Saturday’s meeting was held in a field adjacent to the White Lion pub near Crewe, but I reckon it could just as easily have been any neighbourhood within The Sentinel’s circulation area. The campaigners in this instance are vehemently opposed to a planning application by Cheshire East Council to create a plot in Coppenhall to house 24 trailers, 24 vehicles and an amenity block. In fairness to the local authority, it is simply discharging its statutory duty to provide sites and amenities for the travelling community. The problem that Cheshire East, and I dare say all other councils have, is that finding a suitable location for such facilities is nigh on impossible because of the level of opposition from local residents. Those who support the travellers’ unusual way of life rail against what they see as persecution of a minority. They view objections as little more than NIMBYism and blame it on a lack of education and understanding of this unique ethnic group. But the truth is that, faced with the spectre of a gypsy camp appearing on our doorstep, I’m damn sure most of us would react in the same way as good folk of Coppenhall. You see, it has very little to do with the fact that this proposed site would spoil a picturesque bit of the countryside. Neither does it have anything to do with the ecology of the area or whether or not there may be a colony of great crested newts lurking on the site. These arguments may well be heard in the coming months but the crux of the matter is that families and traders simply don’t want gypsy sites anywhere near their homes or businesses. The people of Coppenhall have quite legitimate concerns about the detrimental effect any such development would have on their lives. They are afraid of the potential affect on their livelihoods and on house prices. They are concerned about the ability of local schools to cope with an influx of children and the effect a significant increase in traffic would have on an area already dubbed an accident blackspot. Rightly or wrongly, the public perception of travellers’ sites is that they spell trouble. In North Staffordshire this reputation has not been helped in recent years by numerous incidents where travellers have set up illegal camps and caused a nuisance. For example, in May 2009 a charity event in aid of the Staffordshire Regimental Museum had to be cancelled when a group of travellers parked their caravans on land where a re-enactment was to take place. You may remember they used a second World War pillbox as a toilet. A quick trawl through The Sentinel’s archives in the last couple of years also throws up stories of problems caused by travellers pitching up illegally in Shelton, Fegg Hayes, Fenton and Tunstall among others. In every case they left behind a mess which cost the taxpayers of this city tens of thousands of pounds to clean up. However, in this country’s nonsensical rush to appear tolerant and inclusive of all minorities, groups such as the travelling community are often accorded special treatment. Just think of the way in which the Dale Farm traveller site saga unfolded. In truth, mistakes were made on both sides of the argument surrounding the UK’s largest illegal traveller encampment in Essex. But it cost more than £20 million, numerous appeals, and we had to endure hippies chaining themselves to railings and nauseating pleas by showbiz types who should know better before common sense prevailed. Had it been Joe Bloggs from Sneyd Green who had built a home without planning permission then I get the feeling the law of the land may have been enforced a little quicker. The fact is that the traveller way of life is so at odds with how the majority of us live that it is bound to lead to resentment. Is it any wonder the people of Coppenhall are up in arms? Just like the other 11 communities before them who fought off plans for this particular gypsy amenity, I wish them every success in their battle to preserve the Coppenhall way of life. That’s all well and good Mart but what is your answer? Ban ALL caravans just as Clarkson would, I could live with that but other than that you have to have an alternative local authorites have to have an alternative and that means on someones doorstep unless they’re dropped in to the middle of the english countryside and imagine the uproar that would cause.